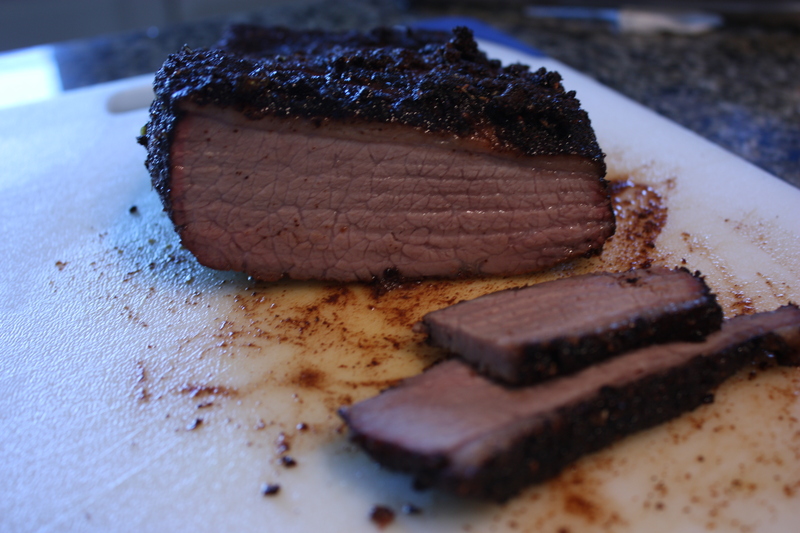 Since this was my first attempt at smoking meats, I simply followed the Lean and Mean Texas Barbecued Brisket recipe from a cookbook I have called How to Grill by Steven Raichlen. Instead of using a full brisket I used a flat cut section, weighing about two pounds. The recipe involved a rub, which is applied a few hours before cooking, and a beer- and vinegar-based mop, which is used to baste the meat during cooking. Both were simple and easy to prepare. We had all the ingredients in the house already, except for the onion powder, so I decided to skip the trip to the store and I omitted it. How to Grill also described how to use wood chips in a gas grill. Basically you make a little pouch out of aluminum foil for your wood chips and place it directly onto the flavor bar over one of the burners in the grill. The recipe recommends one handful of wood chips pre-soaked in water for about 20 minutes per pouch. This worked pretty well but instead of small slits in the top of the aluminum foil, which didn’t seem to let out enough smoke, I ripped opened the top of the pouch completely. Each pouch lasted (produced smoke) for about 45 minutes for me. The only other trick was to find the right temperature in the grill. I started out at a real low temperature with one burner lit, set to just below medium. The built-in thermometer was reading a steady 220 degrees. This was way too low (built in grill thermometers are notoriously in accurate). Nothing was happening. No smoke and no cooking. After some experimentation I eventually found a sweet spot on my grill using two burners set a little above medium. This held the grill thermometer at a steady 425 degrees. I also used two wood chip pouches at a time (one per burner). This setup produced a lot of smoke and I think the right amount of heat around the brisket. I let it go like this (changing wood chip pouches about every 45 minutes) for about 4 hours. The result was pretty good! The rub was spicy and had a good smoky flavor. The brisket was fairly moist and very flavorful. Next time, I would lower the cooking temperature a bit and cook the meat to about 160 degrees, instead of the recipe recommendation of 190 degrees. All-in-all, I am very happy with my first “smoking” experience. Rinse the brisket under cold running water and blot dry with paper towels. Combine all the ingredients for the rub in a small bowl and stir to mix. Rub this mixture onto the brisket on all sides. If desired, let the brisket stand in the refrigerator, covered, for 4 to 6 hours. Combine all the ingredients for the mop sauce in a nonreactive bowl and stir until the salt and brown sugar are dissolved. Set up the grill for indirect grilling and preheat to low. If using a gas grill, place all the wood chips in the smoker box or in a smoker pouch and preheat on high until you see smoke, then reduce the heat to low. When ready to cook, if using a charcoal grill, toss 1 cup wood chips on the coals. 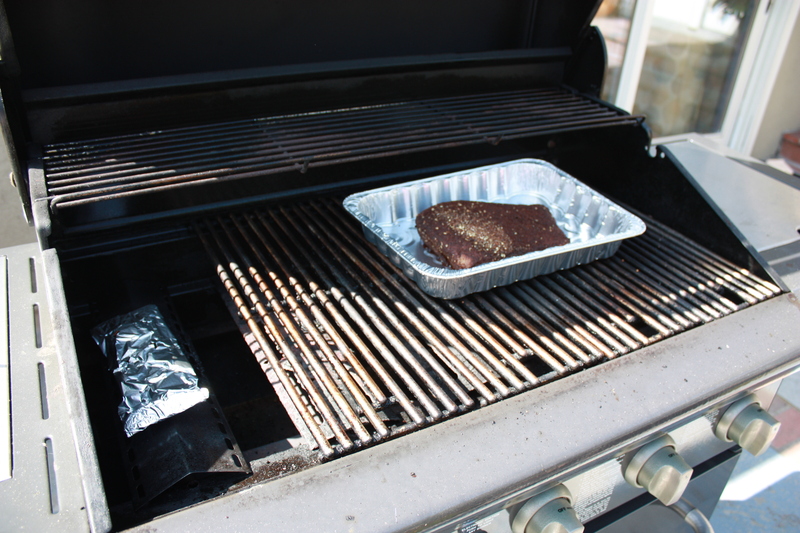 Place the brisket, fat-side up, in an aluminum foil pan and place in the center of the hot grate, away from the heat and cover the grill. Grill the brisket until tender, about 6 hours. (The cooking time will depend on the size of the brisket and the heat of the grill.) Baste or mop the brisket with the mop sauce once every hour for the first 4 hours. If using a charcoal grill, you’ll need to add 12 fresh coals and 1/2 cup wood chips per side every hour. To test for doneness, use an instant-read meat thermometer: The internal temperature should be about 190°. 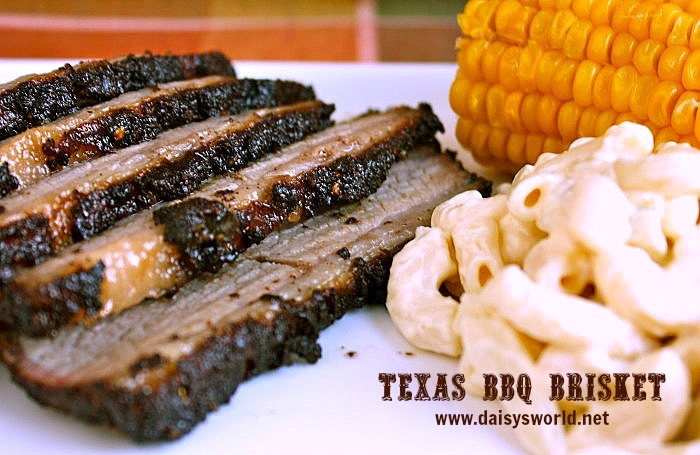 Transfer the brisket to a cutting board and let rest for 10 minutes. Thinly slice across the grain, using an electric knife or sharp carving knife. Transfer the sliced meat to plates or a platter; pour the pan juices on top. Adapted from How to Grill by Steven Raichlen. 2001 Cahners Business Information, Inc.